With my departure from Hong Kong looming before me, I’ve given in to gluttony and am eating my way around Hong Kong to dull the pain of goodbye. Short on time, I’ve focused on a few institutions: (1) Tim Ho Wan 添好運 in Sham Shui Po; (2) Khyber Pass Mess Club at the infamous Chungking Mansions in Tsim Sha Tsui; and (3) the exclusive China Club housed in the top floors of the old Bank of China Building in Central. Tim Ho Wan is the kind of place where they bring tea to the table for you to wash your own dishes in and where you have to pay for napkins. It’s also cramped and features efficient, but gruff service. It is absolutely perfect. I’ve been lucky enough to enjoy dim sum two weekday mornings recently and haven’t waited more than an instant for a table. I’ve heard, however, that those who arrive at noon or on the weekend have to wait on the hot, steamy street outside in Sham Shui Po for over one hour while dodging the drippy air-conditioners mounted on the buildings above. You have been warned; time your visit well. We did order the BBQ pork buns. We didn’t necessarily choose the Khyber Pass Mess Club. Their persistent tout — stationed on the ground floor of the infamous Chungking Mansions amongst the “ladies tailoring” and “copy watch” touts — and a quick internet search, identified it out as a reliable choice amongst the many Indian “mess clubs” housed in the various tower blocks. Having identified our dining destination, we queued with backpackers for an elevator up Block E. Once at the 7th floor we wound round the narrow halls, entered a rather nondescript door and were warmly directed to a corner table. The place was not busy, but several groups of young Hongkongers, a few South Asians and a Buddhist nun, were all mid-meal upon our arrival. After I become a member (a requisite free step), we were served Kingfisher beers and ordered a predictable assortment of Indian dishes: saag paneer, chicken tikka masala, channa masala, veg samosas and naan. We came away with happily full bellies for a budget price. Haters note: we did not suffer “Delhi Belly” the next day. Did I remember to take a photo of the interior? No I did not. A quick description: fluorescent tube lighting over sturdy, long white laminate tables, grey curtain-covered windows, and little else. Having enjoyed several value establishments, it was time to up the eating game with an evening at the exclusive China Club. This spot is members only and, unlike Chungking Mansions’ “mess clubs,” they mean it: we had to finagle reservations via a friend’s sister’s boss. 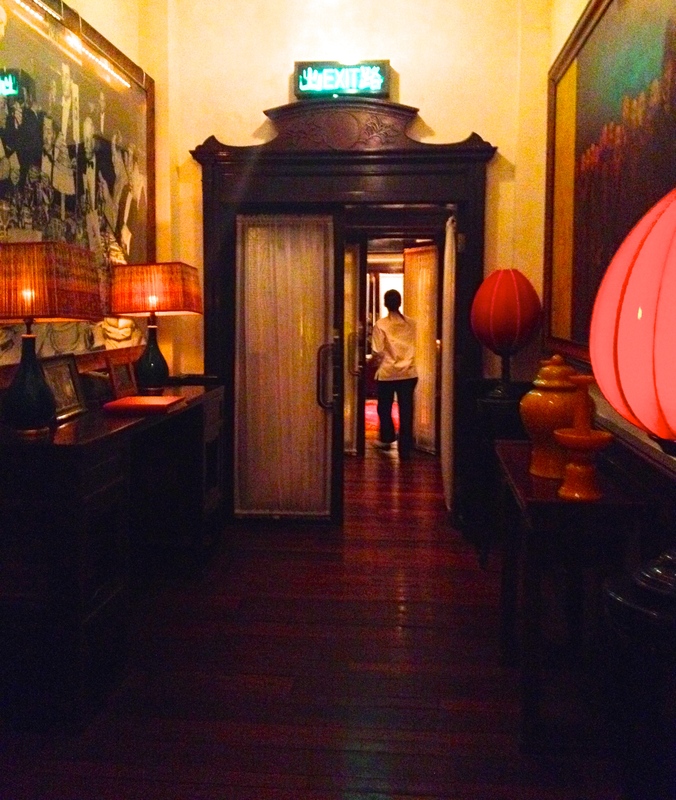 The China Club was established by Sir David Tang in 1991 and is a sumptuous throw-back to what China Hands dream glamorous 1930s Shanghai might have been like. 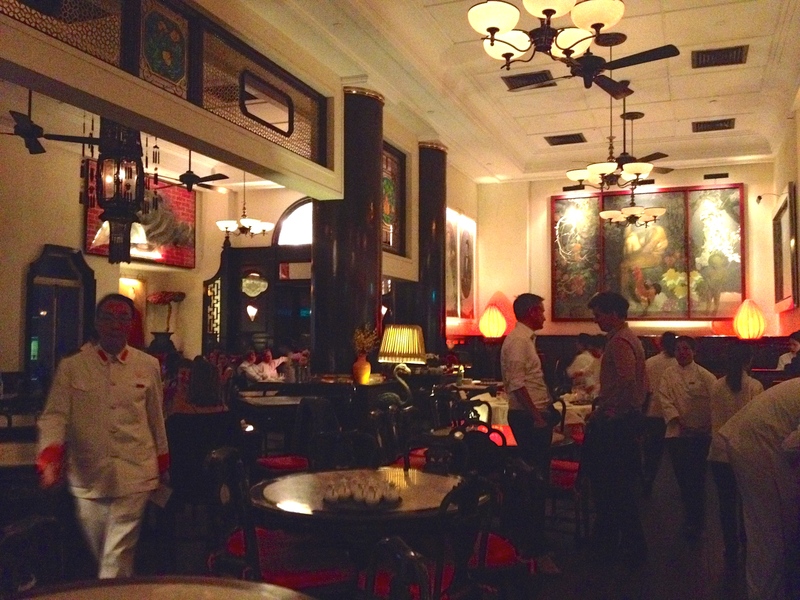 The glow of red lanterns, dark wood finishes and whirling ceiling fans set the colonial feel. 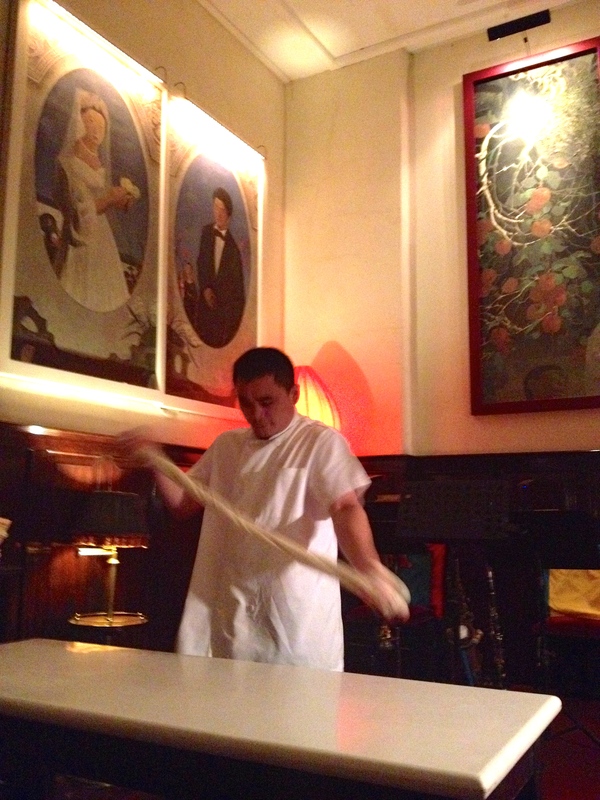 The torch singer fronting a small live band and waiters wearing white uniforms with red and gold trim, place one firmly in the 30s. 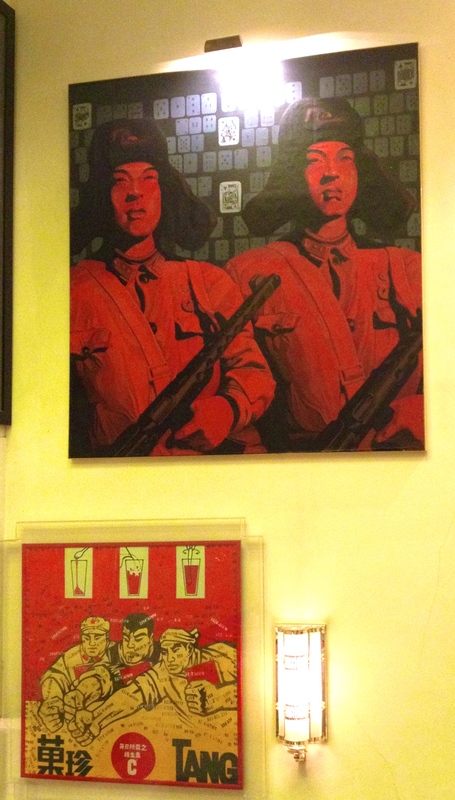 Walls adorned with modern Chinese art, reminds us diners that we are not at a nostalgic Disneyland restaurant, but are still living in the modern era while simply indulging in a hip taste of the past. The food consisted of pleasant versions of Chinese favorites: Peking duck, roasted pork belly, xiao long bao, green beans with minced pork, etc. Wine was served in lovely cut crystal glasses and utensils were elegantly, thin, silver chopsticks. At the end of the meal we were all surprised by a plate of anachronistic (American-invented) fortune cookies. After dinner, we wound our way upstairs, past the library and long bar, to the outdoor terrace for after dinner drinks. Sublime. I have ten days left. Where else should I go? *You’ll note that none of these places have proper websites and that I’ve linked to whatever is the next best thing that will help you figure out where they are and how to contact them. Yes, that’s how cool they are. ← What this expat does next will completely blow your mind! Doing much the same. We leaving in the 28th June. V sad to leave. 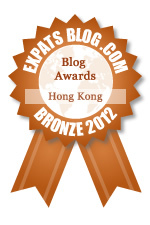 Your musings have been fun to read throughout our time in HK. Where to next? Only concern you may have added to my last minute to do list. With only 9 nights left how to fit it all in! We are off to Utrecht in The Netherlands. Don’t tell the Dutch, but I’m positive the food won’t be as nice (although the air and the cycling opportunities will certainly be better). We want more food posts from HK before you leave, so please use the blog as an excuse for more eating. 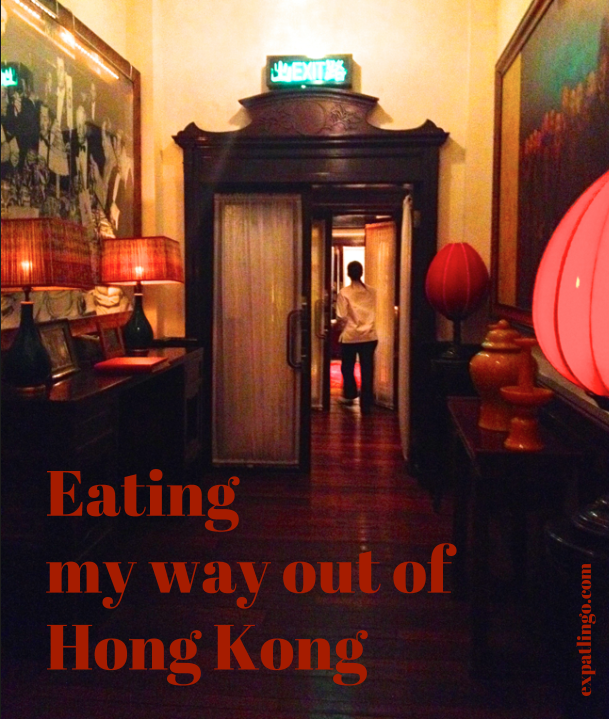 Good thing I’m balancing all my eating out with hiking (another reason to miss Hong Kong…). I think I may eat an entire Peking duck on my own next week. Why stop there? Have the whole flock! Thank you very much for the suggestions! I’m feverishly putting together an eating-out schedule. Love Tim Ho Wan! Another delicious dim sum restaurant is Dim Dim Sum in Wan Chai. It’s quite close to Times Square, and is delicious and cheap. Offers much of the traditional dim sum as well as funky twists on certain options. If you like Japanese curry, Camper’s is an amazing little shop located in Quarry Bay. Auntie Sweet in Tin Hau is great if you have a sweet tooth and enjoy Chinese desserts like mango sago. That’s all I can think of off the top of my head – many other good restaurants. But those are where I’d bring people visiting. Thanks for the suggestions! I’m balancing all of my eating out with hiking and running in the brutal heat and humidity. Ooooo that sounds like a very good curry recommendation! Wish I’d asked you before hand! May try to squeeze in another visit! So glad to hear your daughter has arrived safely! Congratulations! Let me guess her food-related name. Chapati? Mango Lassi? I have no suggestions but I’m pinning yours immediately. Love the sound of the dim sum place at the top – I’d definitely start there. Pin away! I’ve just added in the Pinterest sharing button. My meals out the next nine days will include lots and lots of Peking Duck (particularly the delicious crispy skin). Don’t think I’ll have that again for awhile… Will also eat as many dumplings and steamed buns as I can lay my hands on. I support you fully in both of these. and there it is! But as you mentioned, no interior shot. Shucks, and that’s where dreams are made, and where West Africa gets its mobile phones…worth the haul though, no? As for food tips, if you don’t plan on getting back around there anytime soon, I’d pop up to Shenzhen and stay there for a couple of days. If you already have a visa, that is! Chungking Mansions was worth dodging the “copy watch Rolex” guys for. Popped up to Shenzhen last week, but won’t fit in another trip. Do plan to consume my body weight in roasted meats over the course of the next 5 days. are you a fan of Hui Lau Shan? I’m not so into Hong Kong style desserts. Am I missing out?